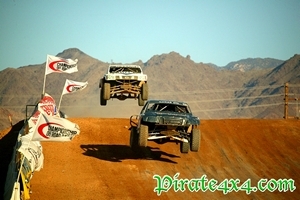 If you check out the main page on Pirate4x4 very often then you have likely seen images from this season's CORR races. 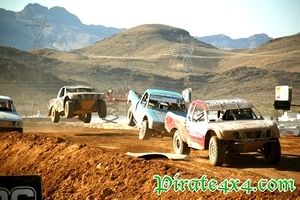 After winning the Baja 1000 and being the pulse for rockcrawling and rock racing, Pirate's move towards short course racing is a natural one. 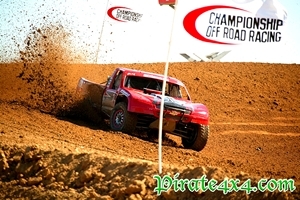 The perfect opportunity to check out what Championship Off Road Racing has to offer came directly after this year's SEMA Show in Las Vegas. CORR owner Jim Baldwin is a shrewd businessman and new that holding CORR's season finale near Vegas directly after the world's largest automotive tradeshow would bring in the fans. Baldwin worked with the Herbst family to design an entirely new course in Primm, where the Herbst coincidently just purchased all three of the local casinos. The move worked, as the stands were packed on Saturday and Sunday. We even saw several rockcrawlers in the stands, such as Rick Deremo, Cottin Rodd, Nick Campbell, and Becca Webster. Rumor has it that some of them might even be following in the footsteps of Marty Hart and leaving the rocks behind for the allure of going fender to fender in the dirt. After scoring a ride over the course in a 500 horsepower buggy on Friday, it is easy to see the appeal. In many ways, this is what RockCross and rockracing want to be. 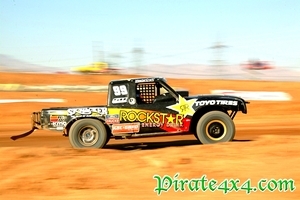 Celebrities, packed stands, major sponsorships, semis, pit crews, television coverage, the whole enchilada. 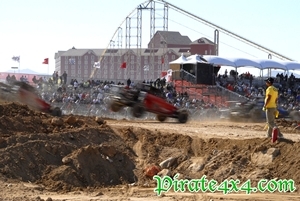 The big show started slowly on Saturday morning with the side-by-side and Trophy Kart competitions. These classes are great for getting kids involved in the sport, many of whom have parents who also race. During the event spectators also have an opportunity to walk through the open pits, score some stickers and posters, and see their favorite drivers up close and personal. Chad Mittag won the UTV race on Saturday and Parker Grabowski, Trent Williams, and Quentin Tucker won the Trophy Kart races. Following the kiddie classes the Single Buggies hit the course. These buggies are 2WD and use a Type 1 Volkswagen engine and transaxle with 10" of front wheel travel and 14" in the rear. Cory Boyer beat John Fitzgerald in a close race, but it was hard to get excited about 75 horsepower buggies. The Pro Lite trucks was up next and got the fans on their feet. These are the equivalent of Pro Mod in rockcrawling. Pro Lite is a spec class with rigid horsepower and wheel travel requirements. Vehicles are limited to 300 horsepower, 12" of front wheel travel, and 14" rear wheel travel. Despite the similarities in vehicles, Kyle Leduc was far faster than the rest of the field. He was followed by Rodrigo Ampudia at the beginning of the race, but Ampudia fell back, leaving Garrett Wallace to take second. Rob Naughton spun on Turn 3 early in the race, leaving him back in the pack, but his finish secured him the season championship in Pro Lite. 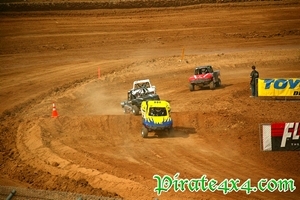 After the Pro Lite ceremony it was the Super Buggies turn on the track. These would be the short course equivalent of Formula Toy, requiring smaller investments than the Pro classes but with just as fierce competition. These buggies have double the horsepower of the Single Buggies and considerable more wheel travel. Rob MacCachren won by a large margin, providing a glimpse of what was to come next when MacCachren raced in Pro 2. When the big boys finally came out to race in Pro 2, MacCachren won again, but Carl Renezeder's second place finish was good enough to give him the series championship. Pro 2 trucks are the real deal, with 800 horsepower, 18" of front wheel travel, and 20" of rear wheel travel. This seems to be the class of choice for Trophy Truck drivers, such as Alan Plueger, Jesse Jones, and Travis Coyne. 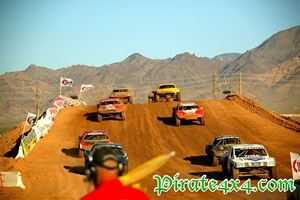 Celebrities Robby Gordon, Ricky Johnson, and Jeremy McGrath also compete in Pro 2, although Gordon was absent due to a conflict with his NASCAR schedule. As the sun was fading, the Pro 4 trucks lined up on the track. These have similar wheel travel and horsepower to the Pro 2 trucks, but with the added traction of four wheel drive. Johnny Greaves showed why he is the best in the business, beating out Josh Baldwin and the Herbst brothers for the win in Pro 4. At the end of the first day fiberglass body parts littered the track and the pit crews were busy burning the midnight oil replacing parts in order to be ready for Sunday's action. Morning came late and the teams got a much-needed extra hour of prep time thanks to daylight savings time. Carnage was limited on Saturday, but that all changed Sunday morning when John Marking rolled hard in his Pro-4 truck in qualifying. Marking was taken away by ambulance and was conscious the whole time, but it is unknown how this accident will affect his plan to race in this year's Baja 1000. CORR runs point races on both Saturdays and Sundays four weekends a year, so the Trophy Karts, UTVs, and buggies were out on the track again. Once they were done, it was time for the biggest show of the day: the Jason Baldwin Memorial Cup. Jason Baldwin died in a plane crash two years ago, and since that time his father Jim Baldwin, owner of CORR, has held a race in his son's memory. This winner-takes-all race has a $66,000 purse and pits the top Pro 2 and Pro 4 teams against each other. It was looking like Rob MacCachren was going to notch up another win, as he lead during the first few laps by a wide margin. The trucks were bunched up when the yellow flag came out due to dust on the course, and then they were stopped altogether after Johnny Greaves went into the wall and pulled down the fence in front of the stands. 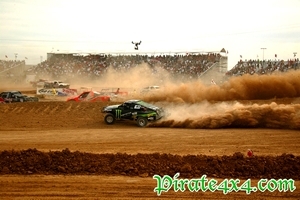 The course was watered down at that time, giving a distinct advantage to the Pro 4 trucks. Indeed, Carl Renezeder and Josh Baldwin moved to the front of the field when MacCachren was not able to maintain traction through Turn 2. Johnny Greaves was in the hunt as well, and actually took the lead from Renezeder under the white flag. Renezeder bumped Greaves coming out of Turn 2 though and was the first to the finish line. Greaves was not happy about the outcome, and judging by the screaming in the bleachers, the fans were not happy either. After the champagne had soaked into the course, the Pro Lite trucks came back out. As with the previous day, Kyle LeDuc was blistering fast. Unfortunately a bent wheel took him out of contention, leaving Rodrigo Ampudia to take the lead. As on Saturday, Ampudia faded away at the end of the race and came in third. The win went to former quad racer and rockcrawler Marty Hart for his first victory of the season. 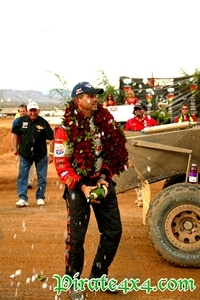 Hart was joined on the podium by fellow Maxxis driver Robert Naughton. Instead of saving the best for last, the Trophy Karts and Super Buggies came back out after the Pro Lite race. 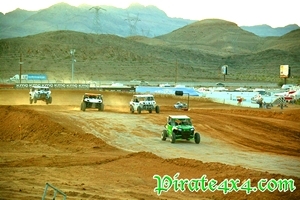 With daylight savings time in affect light was fading and there were still Pro 4 and Pro 2 races to run. 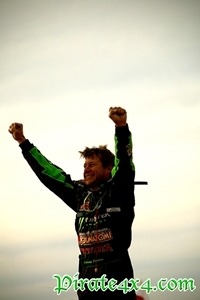 Scott Douglas won in a wild race in Pro 4. Wrecks by Johnny Greaves, Ed Herbst, and Rick Huseman allowed Douglas to finish ahead of Josh Baldwin. Red Bull's Rob MacCachren won yet another Pro 2 race under fading light, but Monster rival Jerry Whelchel took the overall series win. At the end of the weekend we were dirty and tired� but hungry for more. After you have witnessed 800 horsepower trucks jumping 200 feet through the air and rubbing fenders at 70 miles per hour, rockcrawling looks pretty sedentary. 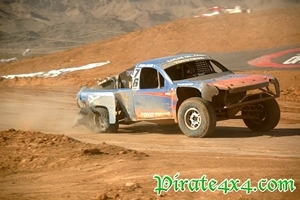 Of course not everyone can afford to buy a $200,000 race truck, so we will keep to our rockcrawling roots, but expect to see more hardCORR coverage on Pirate in the future.